Thanks to your feedback, Swimia has become in just several months one one of the most vital websites of swimming pools. Here you may have all of the info we know about Piscina Comunale F. Fabiano, in Varese. Do you realize the opening hours? Are they offering any course? What's the cost for a single swim? 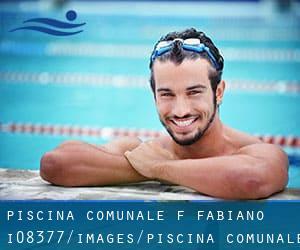 Don't forget you can also promote this pool so Piscina Comunale F. Fabiano will appear the very first of Varese, or even the first of your country, get in touch with us to know additional. Swimmers like you reported 25 meters x 16.6 meters, 7 lanes, 1.8 meters depth, 1.8 meters depth, Indoors. Phone number and e mail address are number for this Swimming Pool. Updated on 2019 Via Albani, 33 , Varese , ITALY (Postal Code: 21100). Swimmers like you reported 25 meters, Indoors. Phone number and e-mail address are number for this Pool. Updated on 2019 Viale Resegone, 15/bis , Varese , ITALY (Postal Code: 20020). Swimmers like you reported 25 meters x 12.5 meters, 1.4 meters - 2.5 meters depth, 1.4 meters - 2.5 meters depth, Indoors. Unfortunately we do not have the email address of this Pool, but we can give you the phone number. Via San Silvestro, 54 , Varese , ITALY (Postal Code: Unknown). Among all the activities offered by the center, if you are keen on swimming you will appreciate 25 meters, 5 lanes, Indoors. Just in case you would like to make contact with this Pool prior to dropping by, we only know the phone number.